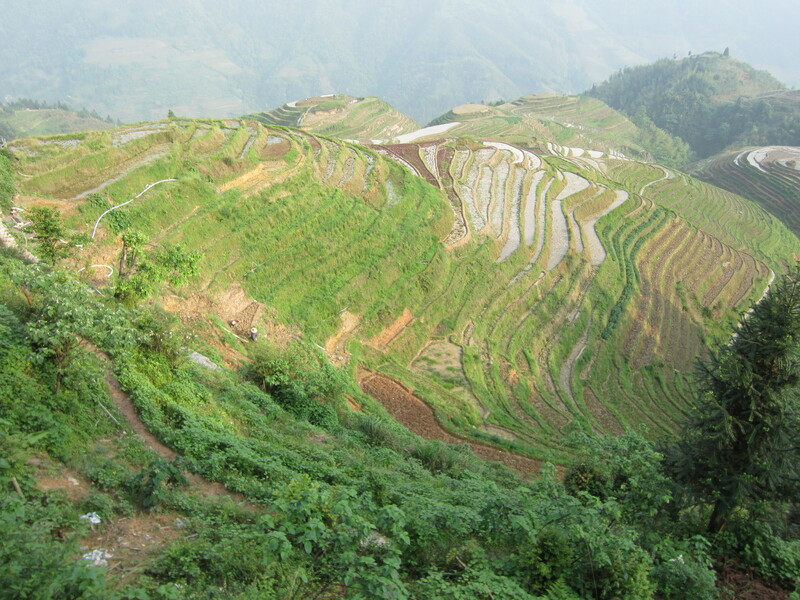 As much as I loved Yangshuo, I was told repeatedly that I simply MUST visit the Longsheng Longji Rice Terraces nearby. My time was limited, but I somehow managed to allocate a day and a half to the trip, and it might have been one of the most picturesque places I’ve found in the whole world. Situated just a few hours from Guilin and Yangshuo, the Longji Rice Terraces are simply a series of rice farms built into the mountains. What makes them special, however, is that the rice terraces are layered on top of one another to make room in the hills. In fact, the terraces are nicknamed the “Dragon Backbone” rice terraces, because the layers resemble the scales on a dragon’s back. The effect is incredible. Layers of green, brown and blue cascade on top of one another, rippling down the mountain and surrounding the tiny villages below. While I was there in early spring, when the terraces were mostly green, apparently the effect is different and stunning in every season. Not going to lie, the trip to get to the top of terraces is fairly intense, with seemingly endless steps carrying you up higher and higher up the mountain. However, if you are feeling especially lazy or regal, you can hire porters to actually carry you and all your stuff on a SEDAN (not the car!) and avoid the whole mess altogether. I will admit, I was pretty tempted (those backpacks aren’t light! ), but I was not entirely comfortable with having people carrying my load up for me, plus I figured it wasn’t the best use of my funds :). 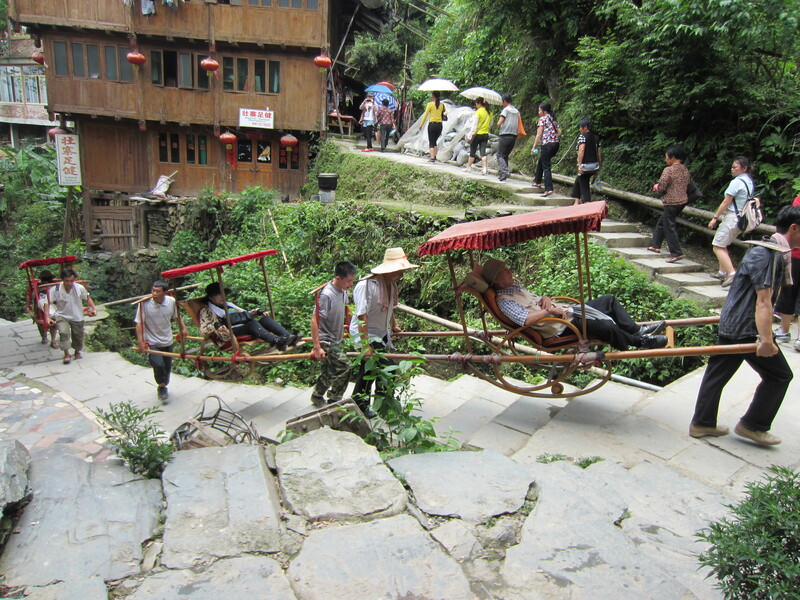 Porters carry tourists up the mountain the old school way. But once that trek to the top is made, the view is simply breathtaking and you can walk all along the ridge at a level pace and enjoy the view from different angles. I was alone with a limited amount of time, so I decided to stay around the Ping An village, which has a relatively short walk. Others, however, can take more time and actually hike from one village to the next, but I enjoyed my time alone just sitting and staring at the magnificent landscape. Here is a taste of the rice terraces below, though honestly, my camera can simply not do it justice.